Texas Housewife: What Time Is It? Dan needs a watch. For years he wore the same watch, purchased from a store most of us shop at. When it wore out, he would go back and purchase the same exact watch all over again. He did this four of five times. It was a fishing watch that told you the best times of day to go fishing, moon phases, and a whole bunch of other stuff that I found pretty amusing. He loved that watch. Then we one day could not find that style again. It made Dan very sad. Now that he has an office job, I feel like he needs a more professional looking watch. 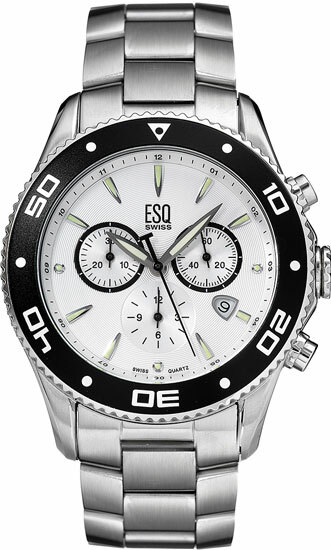 Have you seen these ESQ watches? These are really something! I think they just scream "Sharp Dressed Man". You definitely look high class with something like that on your wrist. I would love to get Dan a watch like this someday. Those watches would make great gifts, not only for the hubby, but the graduate in your life, honoring the folks, a retirement gift, and more. Who wouldn't be thrilled to receive one of them for pretty much any occasion? A time piece like that is sure to be treasured through the years. Wouldn't you love to have one for yourself or to give a loved one?